If you walked into the back while former Bellator middleweight Sam Alvey was getting his hands taped up before a fight, you might find a familiar face doing the wrapping. Sure some MMA fans won’t admit to it, but they watch the popular reality show America’s Next Top Model and that’s exactly where you’ve seen Alvey’s corner woman before. Brittany ‘McKey’ Sullivan, most well known as the cycle 11 winner from America’s Next Top Model, is not only Alvey’s corner and the person who wraps his hands before fights…she’s also his fiancée. It’s a story that’s been building for nearly seven years, long before Sullivan was winning reality shows and prior to Alvey even considering becoming a professional fighter. It was actually love at the Renaissance Fair that brought the two together. “We got set up by a couple of friends of ours at the Renaissance Fair, one was my boss, the other was a co-worker of Sam’s and it was a surprise set up. I showed up to work and his co-worker asked if I wanted to go for a walk and I said ‘yeah sure why not’ and so we’re just strolling through the Ren Fair, having a nice day and he stops to say hi to some people and he pulls me forward and puts my hand in Sam’s hand and he says ‘Sam this is Britt, Britt this is Sam, now converse’,” Sullivan told MMAWeekly.com. A couple hours after the initial meeting, Alvey was looking to impress the pretty girl he had just met so he sent her a flower to where she was working at the fair. Unfortunately, he addressed the card sent with the flower to ‘Becky’ instead of Brittany, but all in all it was still a well-received gesture. The rest as they say is history…Alvey and Sullivan have been inseparable ever since. Now you might wonder how from that starting point a model and a fighter built their futures together, but each was instrumental in the other’s success. For Alvey, who was interested in the world of MMA, it was having a support system around him that believed he could do great things. Sullivan believed in him so much, she went right along with him when he started training and learning the art of war. “We started Pankration, we both did Pankration together, and he just started getting more and more involved with it, so I just started trying to keep pace with him. He gave me the best job…I get to tell him what to do and if he screws anything up it’s just because he wasn’t listening well enough,” Sullivan said with a laugh. While Alvey was working tirelessly at becoming the best fighter he could possibly become, his girlfriend was still deciding what to do with her future. Sullivan had done modeling in the past and actually tried out for cycle 9 of the reality show, but was turned down for the final casting. So when the time came for another season of the show, Sullivan just wasn’t ready to go back and possibly face that kind of rejection again. That’s when Alvey was the one to step in and serve as inspiration, just as she had done for him. “I was not as involved in modeling when I met Sam as I became obviously. I had quit because I was too fat and unattractive for the modeling world when I was sixteen, so at nineteen I said what the heck give it one more try and see how it goes. Sam had actually dragged me down to the castings for the show because I was like I don’t know if I can do it, I don’t know if I can take all that rejection again. Sam’s like ‘forget it, get dressed let’s go!’. Lo and behold next thing you know, I’m flying out to L.A. and they picked me for the show, and it was just a whirwind,” Sullivan explained. It was during her time on the show that Alvey was actually getting ready for a big move of his own. He was finally making his professional fighting debut, and Sullivan was right there as always, even if only in spirit because she was actually filming the reality show. A few months later, Sullivan was the winner of ‘America’s Next Top Model’ and would go on to be featured in magazines like Seventeen, and became a model for Cover Girl cosmetics as well as other fashion campaigns. 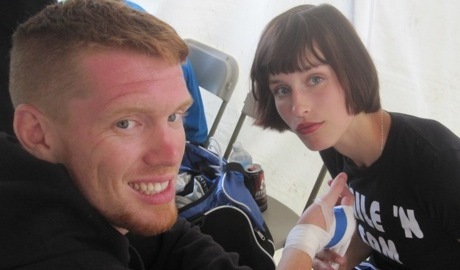 While Sullivan kept working on her modeling career, Alvey continued traveling his path to success in MMA, and his lady was by his side every step of the way. That’s literally the truth because Sullivan has become one of Alvey’s corners during every one of his fights. Now you might try to dismiss that as a significant other just butting into a situation, probably what Alvey would be doing if he tried to teach his fiancée how to strut down a runway in a pair of 6-inch heels. But when it comes to Sullivan’s time in MMA, she was determined to learn and become an integral part of Alvey’s fighting life. “I jumped into training MMA and I train jiu-jitsu as well, and I study up as much as I can, and I’ve gotten really good at picking up on people’s nuances. To me it’s kind of a game, I’d much rather be on the side of the cage looking at what the other guy’s doing wrong, seeing what Sam’s doing wrong, figuring out what we need to do and how we need to manipulate our game plan in order to make the fight turn out in our favor. It’s the place where I want to be,” Sullivan said. To hear Alvey tell it, he’s got 17 professional wins as a fighter and his fiancée is a big reason why he’s gotten this far. Now the couple is embarking on a whole different kind of mission. With Alvey getting ready for a main event fight in New Zealand on March 3, while Sullivan is currently in college as a pre-med/pre-law major with a future in possibly becoming either a neo-natal surgeon or forensic pathologist, they are also planning a wedding. After more than six years together, Alvey and Sullivan are hoping to tie the knot this summer, and spend many, many more years supporting each other in life and their careers. “It’s really exciting and I hope it pans out well, at the end of the day, we just have to be focused on us,” Sullivan explained about wedding planning. Currently separated by thousands of miles while Alvey is in Temecula, Calif. training alongside his teammates at Team Quest, the couple still finds the time to work on a strategy to get their wedding together. Of course to hear them tell it, they’d really like to do a Star Wars themed ceremony, but their families might intervene on that idea. Whatever it ends up being, Alvey and Sullivan are confident that their next 50 years together will be just as exciting and adventurous as the last six plus they’ve spent together. Alvey compliments his better half by noting that her support has driven him to where he’s at right now, and it’s going to continue to drive him as he hopes to one day land in the UFC. Success is just part of this couple’s make-up, so don’t doubt if you see Alvey in the Octagon in the near future and assuredly McKey Sullivan will be right there in his corner cheering him on. Well that and shouting orders at him.